On Monday night I had the privilege of presenting the pre-concert talk at the launch of Musica Viva’s national Beilman & Tyson tour. I’ve often thought it would be a lot of fun to give a pre-concert talk, and I was right! I enjoyed preparing by reading scores and listening to violin sonatas by Mozart, Janacek, Saint Saens and Jane Stanley, and I enjoyed sharing my discoveries with the audience. The sonatas essentially chartered the development of the violin sonata genre from the 18th century to present day. They were well-crafted in their different ways. Each was built around a motif or pool of notes that generated the structure of the entire work. My goal was to highlight those themes so the audience could recognise them in performance. It makes such a huge difference to the listening experience if the audience feels they are following the musical conversation. 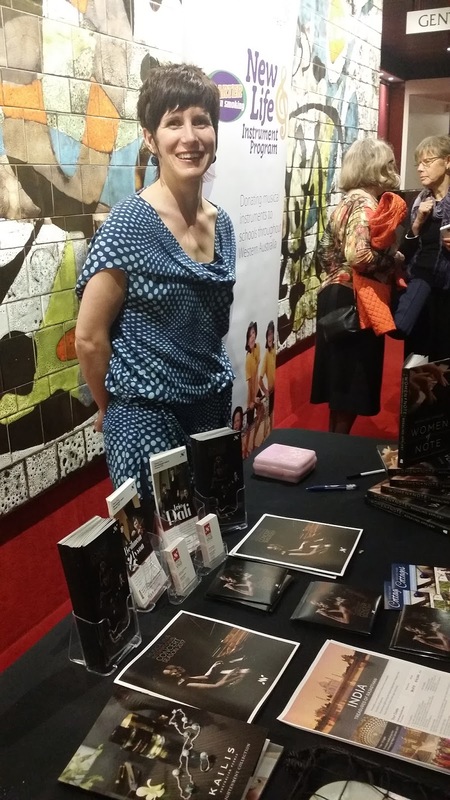 One of the pieces on the program was by Australian composer Jane Stanley, so I was also invited to sell copies of Women of Note at interval. What a fabulous opportunity! It’s nights like these where I really love my job! It is always hard to know whether these public speaking gigs have been a success or not, but I received overwhelmingly enthusiastic responses from the audience, including from a self-described ‘concert virgin’ who said I was his life-saver and had been very interesting. I was also told I was difficult to hear, a serious issue given most in the audience were elderly and probably struggling with hearing complications. I will have to project my voice more in the future! I share that with you as an example of the difficulties women have had and in some cases are still having trying to find equal footing in the male dominated world of composition. Research done in the last few years shows there are still visibility issues for women composers who are under represented in commissioning, concert programs, radio programs and as staff in music education faculties. Which is why the Hildegard project and its commissioning of women composers is so important. Because there are SO MANY fabulous women composers out there, particularly in Australia, where as I mentioned 25% of our composers are women, far more than for example the UK and Finland who clock in at 13% and the US which has 20%. It really is our best kept secret and I am delighted to see Musica Viva celebrating this with the Hildegard commissioning project. So where does Jane Stanley fit into this? Jane fits into what I would call the emerging 4th generation of Australian women composers. She was born in the 70’s when the definition of classical music had broadened considerably since the days of Sutherland. Jane is a fairly traditional composer in that she writes for traditional instruments as distinct from electronics or noise or performance installations. 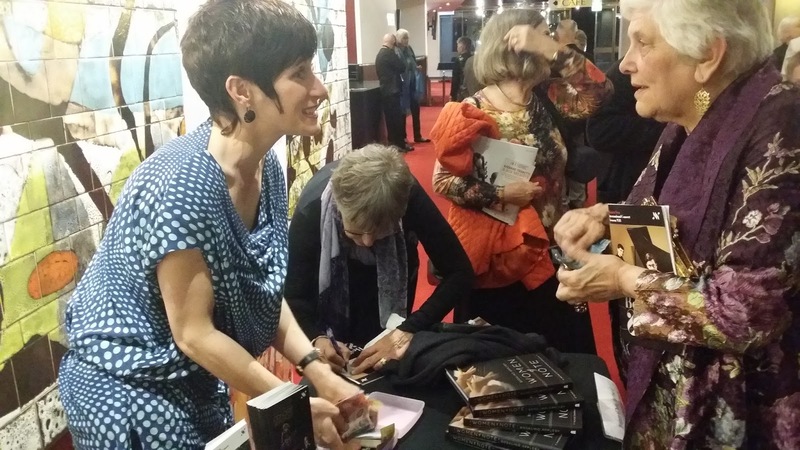 Jane has studied her craft very deeply – studied with the greats of Australian composers: Peter Sculthorpe, Ross Edwards and Bernard Rands in the US. She has participated at the Wellesley Composers Conference, Tanglewood and Aspen Music Festival. She also completed a PhD in composition at University of Sydney under Ann Boyd, from whom she learned an appreciation for space and silence. Stanley is now Lecturer in music at University of Glasgow where the Scots have embraced her and aren’t letting go – she has been there 10 years. Jane tells me she is very sad she is unable to return to Australia for the premiere of this work. The reason is because has a two month old baby who is still a little small for flying. As a composer she has established very distinctive voice. In most of her works there is an absence of recognisable time signature or pulse. Which gives a floating, drifting, stasis. It has a hazy weightlessness. It is beautiful and otherworldly but also sometimes wild. The composer indicates in the program notes of Cerulean Orbits that the two instruments are orbiting around each other. Their music is drawn from the same pool of notes and the composer allows them sometimes to blend, sometimes to antagonise each other. You will notice the piano is emancipated from being a purely accompaniment instrument; both instruments are complete equals. In fact the piano often treated like violin – as a single line shared between the two hands rather than block chords. The music is very carefully crafted – it is not just random notes! Piano begins with a sextuplet of semiquavers which is the thematic core of the work. (Play sample on piano). This is the pool of notes getting introduced that will be the core of the piece. Then the violin enters and hovers on B for 6 bars. In the score the piano part is marked ‘smeared’ and the violin par ‘featherlike’. Jane’s textural style is coming through – it is very tactile; the composer wants us to experience this like it is coming into contact with our skin! 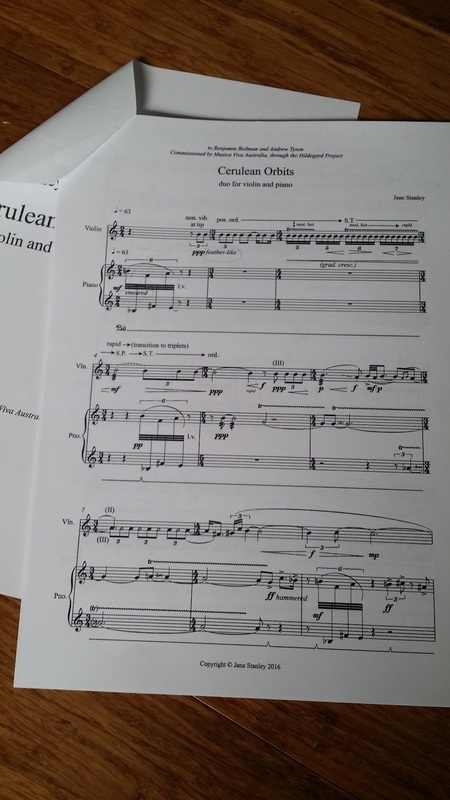 There are huge variation of dynamics and articulation the composer has written into the score giving it an instant intensity even though it is flowing and gentle. The piano part is typical Stanley – scattered notes over a sustained pedal, sounding like droplets. Notes are grouped in 3’s, 5’s, 6’s, spread across the beat so the effect is unpredictable, ungrounded, pulseless, a bit of a nod to Luciano Berio’s piano writing. The middle section is where it gets wild, the score is marked “pulsating… hammered… propulsive… fff ” It is excited and busy, the sort of music that causes audiences to say “It’s not music, its too noisy.” Did you know Mozart’s music was criticised for the same thing? Archduke Ferdinand criticised one of Mozart’s pieces for having “too many notes”! Mozart’s ideas exploded beyond the perimeters of what was usual or predictable and people found it hard to digest. It sounds so elegant and simple to us now. So don’t be put off by the ‘noise’, instead recognise it as fresh thinking that our ears aren’t yet accustomed to. The sense of calm returns at the end of Cerulean Orbits, and the sextuplet from the opening is heard again. This time the piano gets the repeated B’s. it is a floating, spacious ending. The challenge with contemporary music like this is how to make the ideas and phrases clear even when the usual signposts that our ears are used to from traditional music aren’t there? Listen to the texture. Some of Jane’s music is sparse so you get to listen to the beauty and colour of each note as it passes. There are also great washes of sound and the contrast between the textures is like listening to a trickling stream compared to the crashing waves of the ocean. Watch the performers – they help with this: it is their job to bring out the different colours in each phrase, to make each note extremely beautiful. Their body language will hopefully cue the mood changes, to draw us in so we are enthralled.